The spirited gathering, of around 2,500 as estimated by the police, saw the presence of Chandrashekhar’s mother Kamlesh Devi and Bahujan Samaj Party (BSP) founder Kanshi Ram’s sister Swarn Kaur among others. 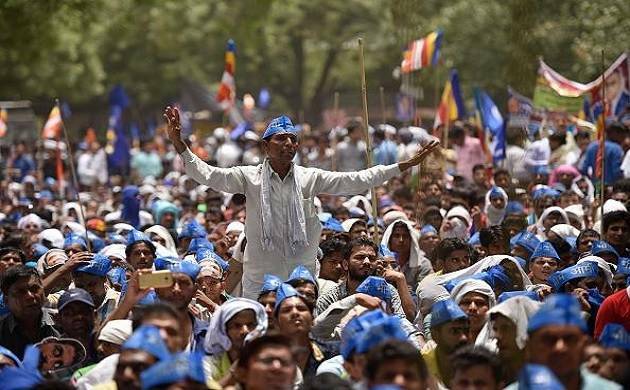 Mobilised by the Bhim Army, a large number of Dalit youths on Sunday hit the streets of Delhi, for the second time in less than a month, protesting caste violence in Uttar Pradesh and demanding the release of Chandrashekhar Azad, the outfit’s chief. The stretch between the Parliament Street police station and the New Delhi Municipal Council convention centre turned into a sea of blue, the colour of Dalit resistance, and pulsated with the cries of ‘Jai Bheem’ as protesters from UP, Rajasthan, Haryana and Punjab trooped in, from around 10 am. “I will protest, sit on dharna and also stage indefinite fast till my son is not released. We will fight. I have no expectation from the Narendra Modi government or the Uttar Pradesh government, especially since the violence has been triggered by the very rise of Yogi Adityanath,” Kamlesh Devi told PTI. Like the previous gathering on May 21, which had seen a bigger turnout, speaker after speaker laid emphasis on keeping the “social movement” away from politics and mainstream political parties professing the Dalit cause like the BSP. “(BSP supremo) Mayawati built her entire career on my brother’s work. This is a new movement spearheaded by the youth. Whenever there’s injustice, the youth will rise,” Kaur said. However, sharp divisions within the ranks of the emerging outfit came to the fore during the demonstration with the organisers pushing down a member from the dais, accusing him of attempting to “hijack” the movement, triggering chaos and confusion. “It is apparent that Bhim Army lacks discipline. But it comprises largely of youths and they will learn with time,” Ummed Singh Gautam, the chief patron of the Samta Sainik Dal, founded by BR Ambedkar in 1926, said. Chandrashekhar, a lawyer by profession, was arrested on June 8 by the Uttar Pradesh Task force from Himachal Pradesh’s Dalhousie in connection with his alleged role in the Thakur-Dalit clash in Saharanpur. His brothers, Bhagat Singh and Kamal Kishor were also present at the rally. Two members of the Bhim Army were arrested in Saharanpur for their alleged involvement in the Ramnagar caste violence on May 9 after a person was killed and several others were injured in a clash between Dalits and Thakurs at Shabbirpur village on May 5.